Chocolates, this magic word makes us very happy especially me and my kids. Chocolates in anything is our favourite. I think its my zillionth time am saying chocolate are our family favourite.Whenever its comes to bread baking, i love to make my dose of sweet breads with chocolates definitely at home. Sweet breads suits prefectly for evening snacks especially to kids, after their long hectic day they need something sweet with enough calorie to boost themselves. Storebought breads are loaded with many preservatives and am trying to keep them away from us,eventhough sometimes its hard to keep away the temping high sugary bakes as we have loads of bakeries in each and every corner of this city. Coming to today's bread, its again an eggless yeasted bread i prepared few days back for my kids evening snacks. 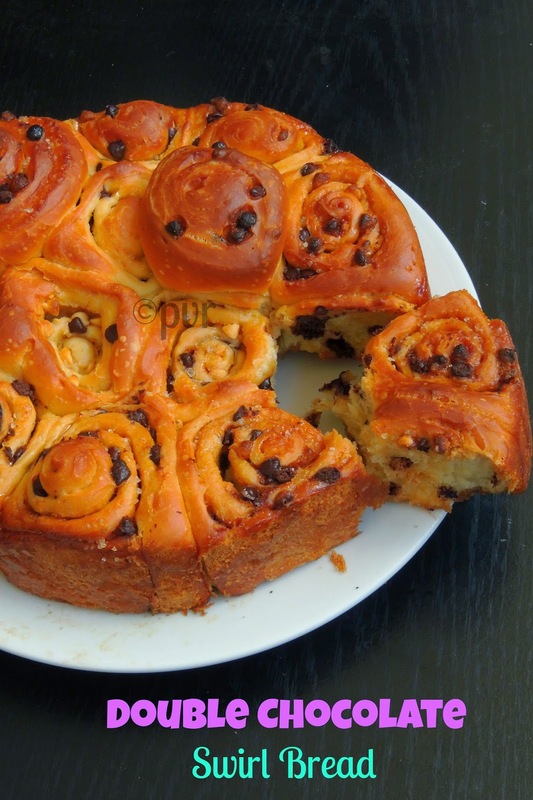 This swirl bread is loaded with both dark chocolate chips and white chocolate chips. A piece of this swirl bread roll with a cup of chocolate drink makes a prefect pair to have a fantastic filling evening snacks after a busy day.This is my last post for this week's blogging marathon as i chosed the theme 'Yeasted Breads' for this week's theme. Hope you all enjoyed my beautiful yeasted breads i have been posting since three days.Check out the Blogging Marathon page for the other Blogging Marathoners doing BM#40. Take the flour,milk powder,powdered sugar and butter in a bowl. Meanwhile mix the yeast,sugar and salt in a cup of luke warm water,keep aside for few minutes until the yeast turns foamy..
Add gradually the yeast to the already prepared flour mixture (add water if needed) and knead everything as a soft,smooth dough. Keep aside in a warm place for two hours,meanwhile keep the chocolate chips in freezer for half an hour. Once the dough doubled their volume,punch down and knead everything well for few minutes. Flatten the dough with a rolling pin as a large rectangular disc, sprinkle the brown sugar followed by both chocolate chips generously over the dough and roll the dough tightly to form a loaf. With a sharp knife, cut the loaf as medium sized pieces. Line a baking sheet over a round baking pan and arrange this swirled rolls one by one and let them sit again in a warm place for half an hour. Arrange the baking pan in the middle rack of the oven and bake the double chocolate swirl bread for 25-30minutes until the crust turns golden brown..
simply looks marvellous! I never understand how to bake good cakes in a microwave. You are a master in baking anything. Looks fab! These look so good! Would love to have some! wow, that bread looks perfectly made , love it!!! You are a great baker, Priya. The bread looks super. just finished dinner and nothing for desset tonight and you are tempting like this. not at all fair. Such a wonderful recipe ..bookmarked ! Looks so tempting, I can have a piece right now.. OMG!! This i out of the world!! Yum!! Bread rolls look awesome.. I like sweet breads a lot. So scared to try the breads...But this looks so good. Will give it a try..
too tempting bread dear,yummmy !!! I would love to pull out at least one from that Priya...:))..no I am not greedy so only one would do...amazing!! 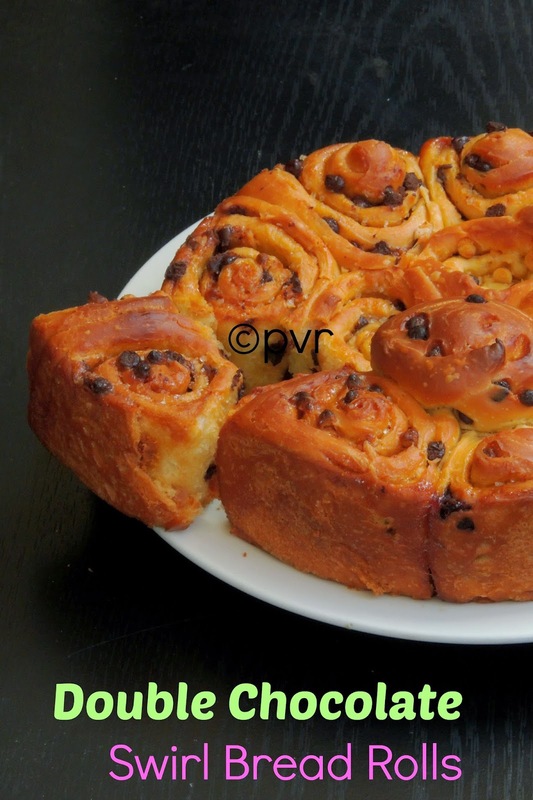 Wow yet another amazing bread... Looks so yummy..
perfect swirls akka..you are one baking diva! 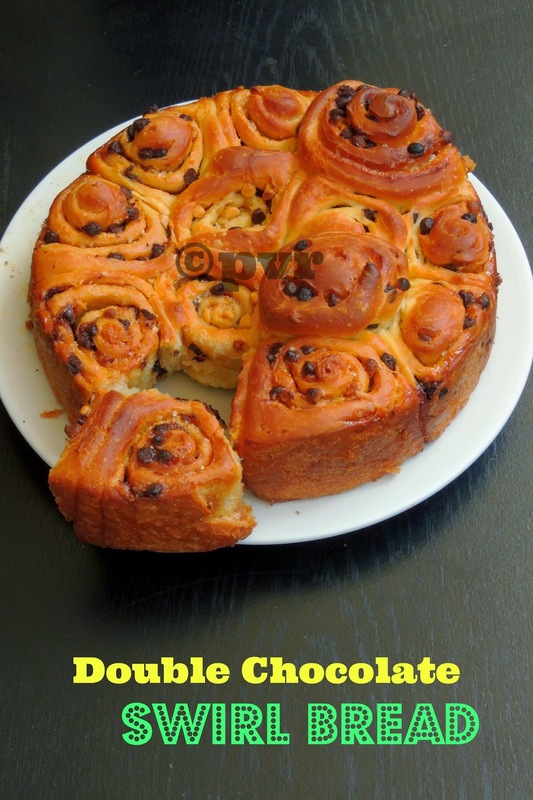 Wow that chocolate swirl bread looks very tempting and so delicious. Yummy rolls, Priya. Loved all your bread choices for this week. What a lovely variation on a pull apart bread. Love the swirls and of course the chocolate. So well done. Priya, I won't mind if you pass it on to me...looks so awesome! Looks so yummy. A chocolate lover in me loves it.